The SBIG ST-2000XM and ST-2000XMI cameras are the same, except that the ST-2000XMI does not include the built-in TC-237H tracking CCD and some of the accessories that are included with the SBIG ST2000XM camera(see the comparison table below). 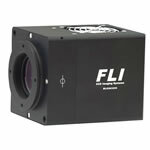 Both versions use the same high quality interline CCD from Kodak, the KODAK DIGITAL SCIENCE� KAI-2020M Image Sensor Megapixel Progressive Scan Interline CCD. The KODAK DIGITAL� KAI-2020M is a high-performance multi-megapixel image sensor designed for a wide range of scientific, medical imaging, and machine vision applications. The 7.4mm square pixels with microlenses provide high sensitivity and the large full well capacity results in high dynamic range. The vertical overflow drain structure provides antiblooming protection, and enables electronic shuttering for precise exposure control to 0.001 seconds. 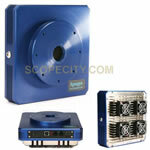 Other features include low dark current, negligible lag and low smear. 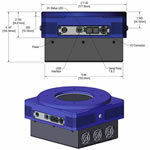 The KAI-2020M CCD is a 2 megapixel progressive scan detector with an active image area of 1.92 million pixels. The active image area is 1600 x 1200 pixels. 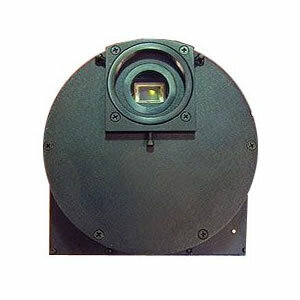 This array is 75% larger than the Sony CCD used in competitors' "megapixel" cameras, nearly as large as an ST-8XME, and the SBIG ST2000XM model is a self-guiding camera, utilizing SBIG's patented dual sensor design. Although the imaging CCD is nearly the same size as the KAF-1603ME used in the ST-8XME, due to the smaller pixel size it contains nearly half a million more pixels than the ST-8XME. The latest KAI-2020M 2 megapixel CCD retains the improved QE of the KAI-2001M and adds a high gain output amplifier that reduces the read noise by almost half compared to the previous CCD. In addition to lower read noise, the bright points have been reduced by a factor of ~10X and our tests show the typical dark current is also reduced by approximately 2X compared to the previous versions of the CCD. These same improvements are also found in the single shot color version of the CCD used in the ST-2000XCM color camera as of July, 2004 (All ST-2000 monochrome and color cameras beginning with serial number 20407000 or higher). 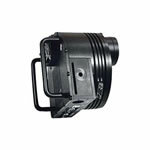 Previously, Kodak improved the Quantum Efficiency of the 2000 series CCD when it upgraded the KAI-2000M to the KAI-2001M. This higher QE is retained in the new KAI-2020M, with approximately 25% to 40% higher QE (10% to 15% absolute) across the visible spectrum than the former KAI-2000M. 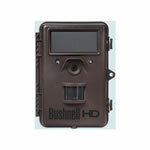 The full frame download time is approximately 4.5 seconds with our high speed USB electronics. The SBIG ST-2000XM camera has antiblooming protection and the quantum efficiency is comparable to the ABG versions of the enhanced full frame "E" detectors used in the former ST-7XE and ST-8XE cameras with a shift in the peak sensitivity toward the blue. Compared to the ABG versions of the full frame "E" series cameras, the ST-2000XM is more sensitive in the blue and green, and slightly less sensitive in the red. The average read noise has been reduced by almost half in the new KAI-2020M CCD. Previous KAI-2000 series CCDs tested just under 14e- rms but the new KAI-2020M typically measures less than 8e-. Measurements made of a number of cameras show that the previous CCDs had an average dark current of 0.13e- and 0.18e- for the KAI-2000M and KAI-2001M respectively. Tests of a similar sampling of cameras made with the new KAI-2020M CCD show an average dark current of 0.06e-. Measurements of the dark current in the top 1% of pixels shows a dramatic improvement. The previous detectors measured showed an average dark current in these pixels of around 2.5e- whereas the KAI-2020M measures on average only about 1.1e-. The lower read noise, lower dark current and reduced bright points combine to significantly enhance the performance of this new CCD. 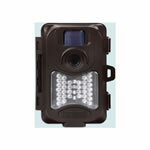 2 Megapixel KAI-2020M imaging CCD with reduced read noise, lower dark current and 10X reduced bright pixels. New Remote Guide Head port, which makes the camera ready to accept the same Remote Guiding Head the STL cameras use. 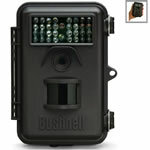 Custom design hard carrying case with pre-cut foam for your camera and accessories (optional with XMI & XUV models).